Have you ever held a pill in your hand that looked as if it could gag a horse–and been seized with terror at the prospect of swallowing it whole? You could bite it into smaller more manageable pieces, but there are other methods that can make the routine of taking your meds much easier than that—and a lot more pleasant. If you only have trouble swallowing bigger pills, you can use a pill cutter to make smaller portions that go down more easily. Another method is to crush the pill with a spoon and mix it with soft food or liquid. But this method doesn’t work with time released pills and capsules, or enteric-coated medications. At its worst, ingesting a pulverized time-delayed medication would release the full dose all at once and might send you to the ER. If your meds are similar to mine, you probably have a combination of time-released pills and those that can be cut or crushed without compromising the drug’s effectiveness. Consult your pharmacist to find out which of your medications can be safely altered in these ways. If you are a caregiver administering meds to an MS patient, liability issues should be kept in mind if the patient has an adverse reaction to a drug you have altered using these methods. This would apply to both patients who can swallow pills and those who use a feeding tube. As always, consult their doctor or pharmacist before attempting it. Let’s say you’re sick of swallowing any more pills and want a different form of medication. Some meds come in liquid form, but if not, you can consult your pharmacy to see if they are able to turn your med into a liquid and even to prepare it with one of various flavor additives. Finding a compound pharmacy is your best bet for these conversions. Ask your regular pharmacy if they can accommodate you or refer you to a local pharmacy that can. Another avenue to explore is the reason why you have difficulty swallowing pills. Most people with these issues fall into one of two categories: they either have an aversion to the idea of swallowing a pill whole even though they are capable of it, or they have a physical condition that causes problems. Of course, one can create or aggravate the other, too. Many MS patients suffer from dysphagia due to nerve damage that affects some of the 25 muscles in the head and neck that are needed for swallowing. If nerve damage affects even one or two of those muscles, the patient might aspirate food or liquid and irritate the lungs. In this case, a speech therapist can teach you to do exercises that may strengthen those muscles and lower your risk of developing aspiration pneumonia. It bears mentioning that opening a prescription drug bottle can cause problems of its own. If your pharmacy doesn’t use the easy-to-open caps for your pills, call them and request that they put a note in your file to use these caps. I just called my local CVS to start putting those caps on mine. 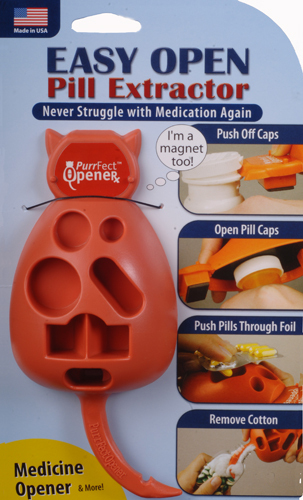 There have been plenty of times that I’ve had to delay taking a med or refilling my pill organizer until I could muster the strength to twist off the child-proof cap. Or, I put so much pressure on the cap that the bottle flies out of my hands and spills a month’s worth of pills on the floor. Swallowing a lot of pills is a vital part of the daily routine of many people with MS. Most information we read about medications is focused on the acquisition and cost of these meds. More information is needed about making our meds easier to take. Finding ways to make it easier to medicate gives us a better chance at compliance. Taking medications the way they should be taken allows us to experience the full benefit of those drugs. It’s a quality of life issue all the way down the line. In the bigger picture of managing our disease, these techniques are part of the fine-tuning–and some of the very few things in life we actually can get hold of to make life with MS a little bit easier.